Widely regarded as one of the most beautiful buildings in the world, the Taj Mahal is India’s most iconic landmark. Indeed, it is also hailed as a feat of architecture and construction. But as well-known as it is, many still do not know how it came to be and its purpose. Millions descend upon the mausoleum, but how many of them why or when it was built? 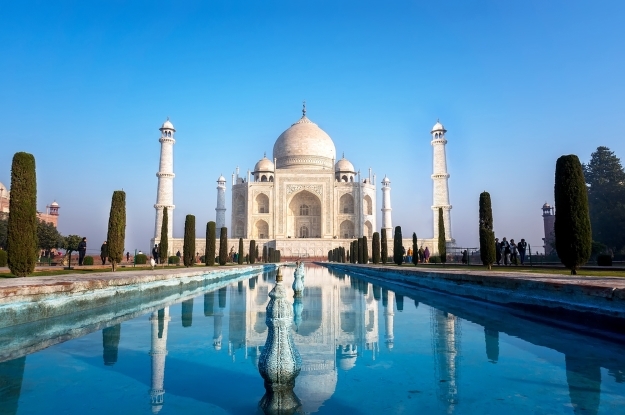 Here we answer the need-to-know questions surrounding this astounding structure as well as revealing the most fascinating facts about the Taj Mahal. The Taj Mahal was commissioned in 1632 by Emperor Shah Jahan as a mausoleum for his late wife, who had recently passed during childbirth. Jahan, a member of the Mughal dynasty, married Mumtaz Mahal in 1612. Mumtaz was the most cherished of his three wives, with Jahan caring for her deeply. Sadly she died whilst giving birth to their 14th child in 1631. Jahan was well known for commissioning extravagant structures during his reign and ordered another to be built in her memory. It took more than 20,000 workers who came from across India, Europe, the Ottoman Empire and Persia, as well as 1,000 elephants, more than 20 years to build. When asked where the Eiffel Tower is, or where can you find the Statue of Liberty you will have no problem in answering Paris and New York, respectively. Both of which are two staggering examples of design and construction. But ask the same question about the Taj Mahal and the majority will only be able to answer, India. The mausoleum complex is situated in Agra in the western Uttar Pradesh state of northern India. Sitting next to the bank of the Yamuna River in the eastern part of the city, it is certainly the biggest attraction in the area. And yet, it was left out of an Uttar Pradesh tourism booklet in October 2017. The booklet listed ongoing and future tourist attractions, as well as a number of current sites of interest, but chose to omit one of the world’s best known landmarks, sparking international attention. Really, the building has put Agra on the map. 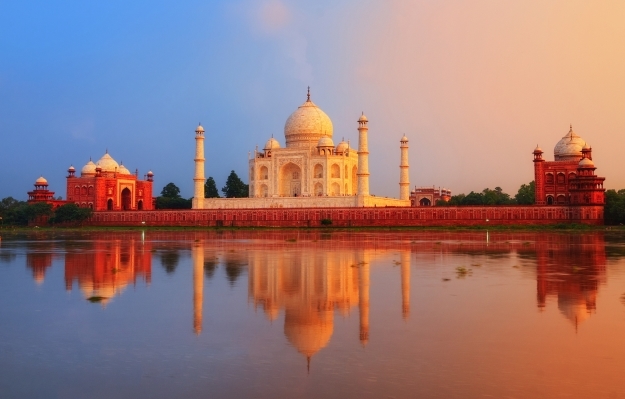 However it is said that the Taj Mahal was not originally meant to be built there. Rather it was destined for a city called Burhanpur, in Madhya Pradesh, where Mumtaz Mahal actually died. The decision to change location came down to the fact that Burhanpur simply did not have enough marble to construct a worthy mausoleum. 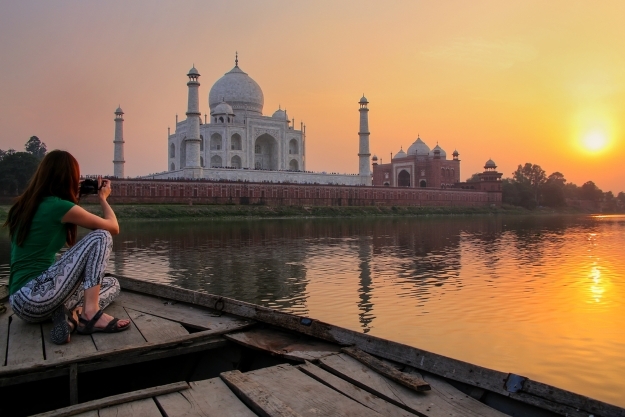 How many people visit the Taj Mahal? More than three million visitors descend upon the Taj Mahal each year, with numbers ever increasing. It is a building that epitomises love and is a symbol of romance for many. Sceptics are reminded of the reason why it was built and urged to stand in front of the incredible structure thinking about how much the emperor must have loved his wife to create such a beautiful shrine for her. Famous faces like Princess Diana have posed for iconic pictures sat on the bench with the building in the background. How old is the Taj Mahal? Construction of the Taj Mahal is believed to have begun in 1632 and continued for the next twenty years. It was finally finished in 1653, meaning from date of completion, the Taj Mahal is 365 years old. The building was designed by Ustad Ahmad Lahauri, who incorporated a Mughal (Persian, Islamic and Indian) style to it. At the time it cost 32 crore rupees to construct, which due to inflation, is hard to quantify in modern money. The Taj Mahal is celebrated for its incredibly intricate design and innovative features. But one of the most noticeable is its change of colour throughout the day. 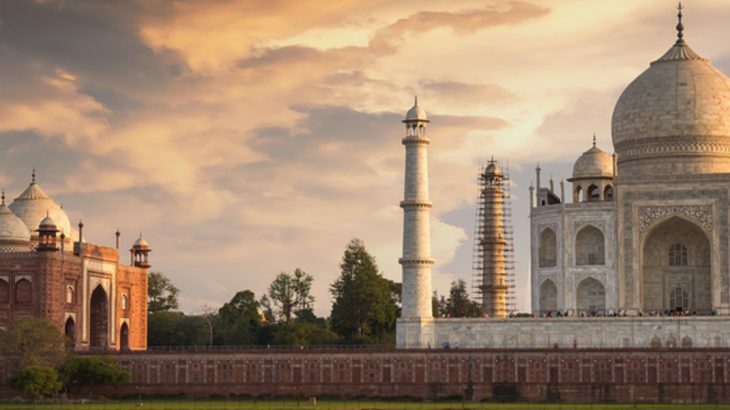 Being made predominantly of white marble the Taj Mahal can change from a pure white to a pastel pink in a matter of hours, depending on the sun and weather. Even at night you can notice that it illuminates with a golden hue from the moonlight. If you arrive early enough to enjoy the sunrise, you may notice how the building flickers between a soft grey and pink colour. Should you be fortunate enough to have time on your hands it is certainly worth sitting from a good vantage point and watching the sunrise to truly appreciate the change in colours, but also one of the most beautiful sights in Asia. 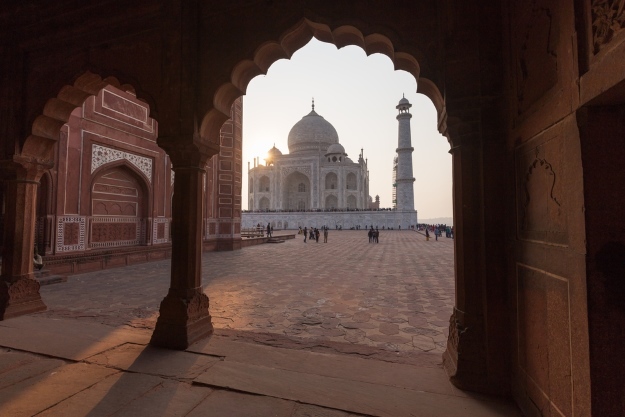 The iconic white images that you have possibly seen of the Taj Mahal are likely to have been taken around midday, when the sun is directly overhead. Sunset is as special as sunrise. The building turns a warming, dark shade of orange. On very rare occasions you could be fortunate enough to see the mausoleum in its orange glow, while the dome remains white. Combine this with the grass that surrounds it and it becomes an poignant symbol of India, as the country’s most iconic building reflects the colours of the nation’s flag. The Taj Mahal can be the highlight of any India tour. But if you are not well prepared you might not make the most of your time at one of the world’s most iconic buildings. We have spoken to experienced bloggers who have all been kind enough to tell us how you can make your trip as memorable as possible. “When you visit a new destination or attraction, it can be nice to explore the surroundings at your own leisurely place, perhaps with the aid of an app or a paper guide. However, when you’re visiting the Taj Mahal, it is definitely worth hiring a professional guide, for a number of reasons. “Firstly, your guide will probably be based at the Taj Mahal every day and they will be very familiar with giving tours. They will share their knowledge of this magnificent structure with you, and I am convinced that I wouldn’t have learnt so much about it if I’d gone it alone. “Entering through the gates of the Taj Mahal and seeing the majestic white beauty in front hits you hard, however many times you see it. But what lacks is the intimacy, because, at any time of the day, you are sharing it with too many people. The Taj Mahal is a work of art. Rightly named one of the Seven Wonders of the World it is an incredible experience to be in the presence of one of the most significant works of architecture in history. So take your time and don’t let the crowds dampen your experience. India history, photography, top things to see, unesco heritage site. permalink.